A highly detailed nautical chart of the English Channel. A Chart of the British Channel, Drawn From the Ordnance and Admiralty Surveys, the Observations of Admiral Sir John Knight, K. C. B., and Other Authentic Documents. This is a large 1838 John William Norie blueback nautical chart or maritime map of the English Channel. The map depicts the region from just west of Ireland to the North Sea and from England, Wales, and Ireland to northern France. 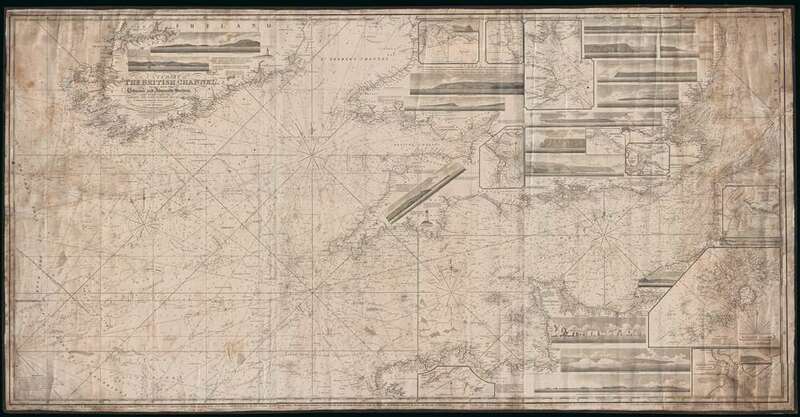 This chart has all of the atmospheric hallmarks of a working nautical chart and a life at sea. Myriad depth soundings are included throughout, including along the coast of St. George's Channel and in Bristol Channel. Numerous soundings are indicated in the Thames Estuary, and the Thames is illustrated all the way to London. Locations along the English, Welsh, Irish, and French coasts are labeled, including Cork, Cardiff, Bristol, Lands' End, Southampton, and Brighton. The Isle of Wight is labeled. Inset maps along the top border include Mounts Bay, Lands' End, Spithead and Portsmouth, Portland, New Haven, and the Isle of Sheppy. Along the right and bottom borders, inset maps detail Exmouth Bar, the Scilly Isles, and Dartmouth Harbor. Several coastal views are also illustrated, including Lizard, Portland, Berry Head, Start Point, Bembridge Point, Beachy Head, Looe Island, the Needle Rocks, and the Scilly Islands. Manuscript red and yellow notations note the location of lighthouses along the English coast. Several lighthouses are illustrated in profile. This map was published by John William Norie in 1838. All examples are rare. This map is owned jointly by Geographicus and Vetus Carta Maps. Good. Soiling. Blank on verso.